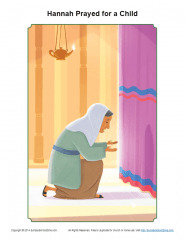 In 1 Samuel 1, Samuel’s mother, Hannah, took her heart’s desire to God in prayer. She prayed for a child. God heard her prayer and blessed her with baby Samuel. Samuel would carry his mother’s devotion to the Lord and would become a great prophet and leader in Israel. This Hannah Prayed for a Child Story Illustration will help kids remember that God still hears and responds to our prayers today. This story illustration can be used in a Sunday School, classroom or homeschool setting.